The fact that two months may be more relaxed and spontaneous when deciding how to spend a day, an afternoon, the weekend or the whole month can represent other types of stress for the body. It's sometimes difficult fotr the body to them mind, even though they are both focused on relaxation and pleasure. Therefore, at the beginning of the summer and during holidays, it is good to pay some attention to your immune system. In the hot days, make sure you have sufficient amount of liquid to drink. If your holidays are sporty, pay particular attention to enjoying enough proteins and minerals. Do you know that tiredness can also be affected by hot sunbathing? We recommend that you have as much vitamin-rich food as possible on your menu. At Medex we understand the desire to make the most of your holiday, we present you with a novelty in which you will be able to take care of your immune system with pleasure. 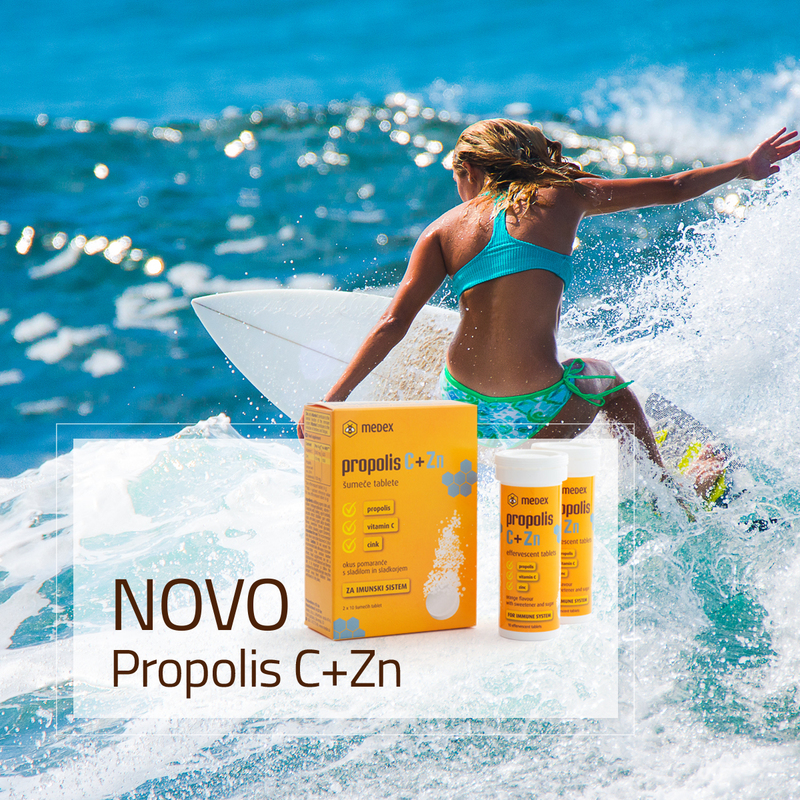 Propolis C + Zn are effervescent tablets to prepare a delicious drink with propolis, vitamin and zinc. Because they are packaged in two tubes of 10 tablets, you can pack them in every bag and take them anywhere. When thirst occurs (or even better before), you will only be dissolved in water and drank. At the same time, you can also look forward to the fact that Propolis C + Zn effervescent tablets are free from aspartame, sodium cyclamate, saccharin and sucralose, which are commonly unwanted components of effervescent tablets. Because Propolis C + Zn is really delicious, maybe some noise can be found in some evening cocktail. Let us know if you will set something tasty and if it's easier to drink the morning after the mix, than if there are no effervescent tablets there. Experience the holidays as you like best!